Ineos, a European manufacturer of commodity and intermediate chemicals with 2015 revenues of US$40 billion, is poised to strengthen its position as a global chemical industry giant once it realises the benefits of importing US natural gas liquids (NGLs) and investment in UK shale gas, says new analysis from research firm IHS Markit. The two investments are intended to improve the cost competitiveness of the privately held company’s UK-based ethylene business, according to the IHS Markit report entitled the IHS Chemical INEOS Competitive Company Analysis. In an industry where several competitors boast histories dating back at least a century or two, Ineos is a relative newcomer, having started in Europe in 1998. Expanding rapidly since then, primarily through acquisition, Ineos has become one of the top-10 largest chemical producers worldwide. Key acquisitions have included BP’s Innovene olefins and refining business, and ICI’s commodity chemical business. “Ineos has experienced tremendous growth in a very short period of time, going from a virtual unknown to a leading chemical producer with 65 manufacturing sites in 16 countries,” said Dave Witte, senior vice president at IHS Markit and general manager of its chemical division. He also says that in its first ten years, Ineos acquired more than 20 targets, enabling the company to become a serious, vertically integrated, large-scale producer. In addition, Witte said, Ineos is a private company, which means that the firm also benefits from a lean and flat hierarchical structure, which assists in its overall efficiency and in avoiding bureaucracy. The IHS Markit report noted that, later in 2016, Ineos expects to become the sole owner of Inovyn, following the acquisition of Solvay’s 50% share for nearly US$382 million. The company also purchased BASF’s 50% stake in Styrolution in 2014, to assume full ownership of the asset and strengthen its market share in the PVC films and compounds segments. 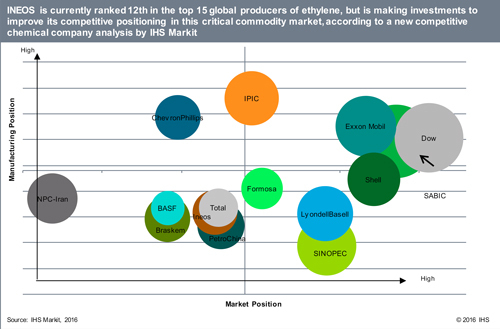 And while many of its competitors are restructuring to better leverage higher margins found in niche or speciality products, Ineos offers a broad slate of products and leads in its chlor-vinyls and styrenics businesses, IHS Markit said. To strengthen its competitiveness and profitability in its chemicals business and mitigate high energy-feedstock costs for its UK assets, the company plans to enter the upstream business in the UK, pledging to invest US$1 billion to explore and appraise shale gas, which is a longer-term investment due to both the uncertainty of shale gas development and its unique set of business and regulatory challenges. At present, the company has a dedicated fleet of Dragon class ships to import a steady supply of NGLs from the US, which helps feed two of its four steam crackers in Europe. In addition, because these ships offer additional spare capacity, they also provide merchant opportunities for Ineos. IHS Markit says that the import of US NGLs to the UK Grangemouth plant will shift the plant’s position to that of an advantaged European petrochemical plant, allowing for a favourable impact on the plant’s cash-cost position during the coming years. Furthermore, since all of the Ineos European crackers have the ability to use different feedstocks in response to price conditions, the firm is said to have a significant advantage over other regional crackers and some of its naphtha-based competitors. High-demand growth in Asia and credit availability may present opportunities for Ineos to participate in additional joint ventures within the region and optimise market growth, IHS Markit said, while the UK’s recent Brexit vote brings uncertainty and volatility to the UK’s business environment, the report noted. In the current volatile energy price environment, Ineos’s partial upstream integration and its narrow geographical concentration of assets make weathering volatility more of a challenge, IHS Markit said. The company has developed several innovative solutions, such as PERT (polyethylene resistant to temperature), which is piping that is increasingly used in domestic hot-water systems, and the company is developing high-rigidity packaging that can be moulded using up to 20% less energy.